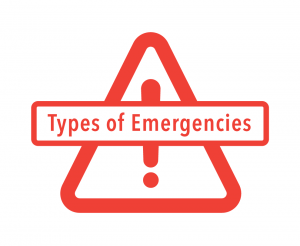 The types of emergencies can sometimes depend on the region where you live. For example, the states along what is commonly called Tornado Alley are more likely to be hit with tornado weather more often than other states. That’s why knowing about the different types of emergency drill procedures and reasons for school closings can be important when moving to a different area. A tornado is an extremely strong atmospheric storm that creates violently funneling columns of air. Many tornados are visible because of condensation, dust, and debris in the funnel, but some can be hard to see. Tornados cause winds that can reach speeds greater than 350 miles per hour in extreme situations, which can toss cars and level buildings in a few minutes. A hurricane is an atmospheric storm, like a tornado, but it starts out over warm ocean water. Hurricanes can have winds with speeds greater than 300 miles per hour. Hurricanes can cover a great area and they can even cause tornados. Fires can be caused because of improper storage of chemicals and improper use of lighters or other flammables. Fire emergencies may also be the results of wild fires caused by lightning, and fires are most dangerous in dry conditions like droughts. An earthquake happens when two fault lines rub against each other under the ground. This can cause the earth to move and break open. Severe weather can happen at any point of the year. Severe weather has the potential to cause damage to buildings and serious injury or death to people and animals. Some types of severe weather include ice or snow storms, damaging winds, torrential rains with flooding, and dust storms. A lockdown emergency is an emergency that prevents people from leaving a building due to a dangerous person, chemical exposure, or other threat. There are many types of drills which schools and businesses use to prepare students and employees for what to do in case of an emergency. Tornado drills and other severe weather drills are commonly practiced to make sure individuals know what to do in case of these types of emergencies. In a weather-related emergency such as a tornado, where the outside of the building is unsafe because of dangerous wind or precipitation, students and staff should shelter in place. In situations where students or staff members are inside a building, but moving around could cause serious injury, such as with an earthquake, students and employees learn the areas in their building or classrooms that will be safest to be in and how to take cover to avoid serious injury. A shake out drill, or evacuation drill, is a drill used to get people out of the building safely when conditions inside a building have become life-threatening. The types of emergencies that shake out drills are practiced for include fires or other on-site emergencies. Schools and businesses can close or delay opening hours for a number of weather-related reasons, which mostly depends on the region. Almost all school closings or delays occur because conditions would be too dangerous for students to wait at a bus stop or walk to school. Storms, dense fog, snow, ice, sleet, extreme hot or cold temperatures, floods or flood warnings, wild fires, hurricanes, tornados, and other extreme weather are all reasons why school hours may be delayed or why schools may close early or not open for the day. To prepare for emergencies, you should know your business’ or school’s emergency drill policies. This will allow you and your children to react more quickly and safely during an emergency. Check your place of business’ emergency management policies. Check your child’s school’s emergency drill policies. Practice emergency drills at your business or school with your peers. Practice emergency drills at home with your family. What emergencies are common in your area? What tips would you give parents who are new to the area?